PVC bottle seals are made of coloful heat-shrink plastic and are available in a variety of colors. 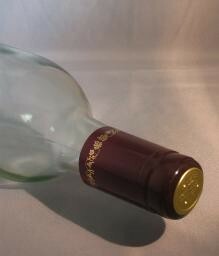 They cover the bottle neck and cork, making an amazing presentation of your prized wine or spirit. Instructions: Place the cap on the bottle and dip in boiling water. You can also shrink by using a heat gun. Regular size shrink capsules fit standard cork finished bottles screw tops and T top tasting corks. Instructions included.